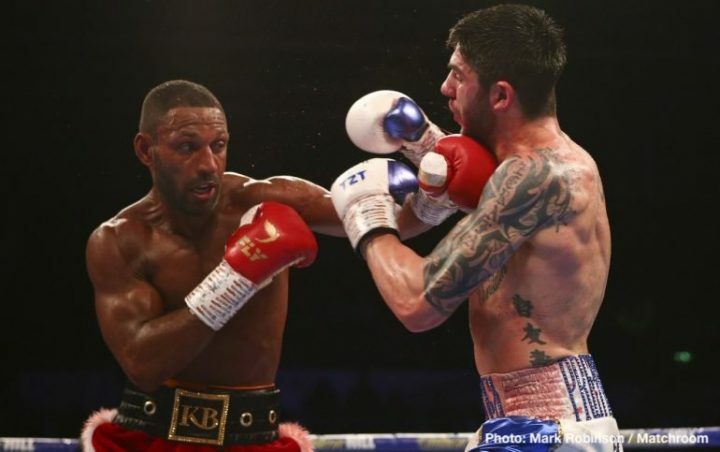 By Jim Dower: Kell Brook (38-2, 26 KOs) won a wide 12 round unanimous decision on Saturday night beating Michael Zerafa (25-3, 14 KO), but it was from easy work in their WBA final 154 lb world title eliminator in Sheffield, England. Brook came out flat, missing shots, and getting hit hard in return by the 26-year-old Aussie. Fighting in front of a large pro-Brook crowd at the Sheffield Arena on Saturday night, Brook took the fight to Zerafa, hitting him with everything but the kitchen sink. Zerafa’s youth and size was able to help him stay in there with Brook the entire 12 rounds. You could see that Brook faded in the 11th and 12th. Had Brook been able to increase the pressure, he might have been able to score a knockout in this fight. Brook couldn’t do it. It was Zerafa that came on strong in the final three rounds of the contest to make it interesting. Brook had gassed out like he did against Gennady Golovkin and Errol Spence Jr. The difference tonight was that Zerafa lacked the huge punching power to break Brook down the way Spence and GGG did. It was supposed to have been an easy fight for Brook over Zerafa. After all, this was a fighter that former WBO middleweight champion Peter Quillin crushed in five rounds in September 2015 at super middleweight. What boxing fans don’t realize is Quillin looked huge after he rehydrated for the Zerafa fight, and he used that size advantage to batter him for five rounds until the fight was stopped. Brook, who weighed in at 150 lbs last Friday at the weigh-in, didn’t have the same weight advantage going for him that Quillin did against Zerafa. For that reason, it was a tougher fight than what boxing fans and Brook thought it would be. Brook made his job harder by standing in front of Zerafa, not showing any head or upper body movement. With Brook fighting in a stationary manner, Zerafa was able to catch him repeatedly with double and triple jabs to the head that snapped his head back. Zerafa was also landing a lot of right hands, and left-right combinations to the head of Brook that got his attention throughout the fight. Brook came out ahead tonight in beating Zerafa by the scores 118-110, 119-109 and 117-111. The score that most accurately described the fight was the 119-109 score. Zerafa landed some nice shots, but Brook got the better of him in at least 11 of the 12 rounds. Brook was at a loss for words to describe what went wrong for him tonight after the fight. He says he was unable to pull that trigger on his shots, and was “flat.” Never the less, Brook is still counting on his performance against Zerafa to lead to him getting a big fight against one of the top welterweights or Amir Khan. Jarrett Hurd, the WBA junior middleweight champion, is also an option for Brook. In the 12th round, Brook came out looking to score a knockout, but Zerafa was catching him with some massive shots. There was not way that Brook was going to be able to stop Zerafa with the way he was fighting in the final round. Brook can probably get a fight against Jarrett Hurd if he and his promoter Eddie Hearn are willing to go that route. Brook might even look good in the early rounds against Hurd, as we saw with Jason Welborn in his recent fight against the champion. However, once Hurd starts firing on all eight cylinders, his pressure is likely going to grind Brook down ti nothing unless he looks a lot better than he did tonight and in his losses to Gennady Golovkin and Errol Spence Jr. Brook would be favored in a fight against Amir Khan, but probably not against Hurd. That’s a different type of guy, and might end really badly for Brook. Kell’s promoter Eddie Hearn likely won’t want to make the Hurd vs. Brook fight. It’s a mystery why the World Boxing Association made tonight’s Brook vs. Zerafa fight a final eliminator. First off, Zerafa doesn’t deserve to be fighting in an eliminator against anyone based on his weak resume of poor opposition and losses against the only decent opposition he’s ever faced. Secondly, Brook has made no mention of wanting to fight any of the champions at 154. Brook’s goal is to fight Khan in what boxing fans believe will be a cash out fight followed by retirement. Brook says if he can’t get the Khan fight, then he wants to fight for a world title against one of the welterweight champions. Again, Brook has said zero about wanting to fight for a world title against 154 and he’s not been calling out Hurd, WBC 154 lb champion Jermell Charlo or even newcomer WBO champion Jaime Munguia. Brook is mostly just talking about waning to fight Khan, and he’s spent all of 2018 fighting tune-ups just so he doesn’t get beaten before he faces Khan. Brook was landing uppercuts, hooks and right hands all night long against the 26-year-old Zerafa, but his punches had no effect on him. Those were the same shots that Brook was hitting former middleweight champion Gennady Golovkin with in their fight in September 2016, but he was able to take them without any problems. Brook seemed more bothered by Zerafa’s punches than the other way around. It would have been good if Brook had revealed to the boxing fans afterwards that he was fighting at only 50% for the entire fight against Zerafa. At least then the fans would see the possibility of an improved performance from him when he faces the likes of Amir Khan or Jarrett Hurd. However, Brook was at 100% tonight, he couldn’t get his shots off, and he was getting hit a lot. Zerafa is a lesser fighter, and not a true world class guy. Brook struggling against a mediocre guy like Zerafa was a bad look on his part. Zerafa was countering Brook all night long with heavy shots, and doing a great job of it. Zerafa didn’t have the punching power to take Brook out the way that GGG and Spence did. You’ve got to give Brook credit for facing Golovkin and Spence in the past, but he does not look good enough now to beat any of the champions at 147 or 154. Brook might not even be good enough to beat Khan. After tonight’s performance by Brook, you can bet that Khan is thinking seriously about fighting him. The champions at 147 stand to gain nothing in fighting Brook, so there’s no point in them bothering to set up a fight against him.